Martin Van Buren (Dutch : Maarten van Buren December 5, 1782  July 24, 1862) was the eighth President of the United States (183741). A founder of the Democratic Party, he served in a number of senior roles, including eighth Vice President (1833-37) and tenth Secretary of State (182931), both under Andrew Jackson. Van Buren won the presidency by promising to continue Jackson’s policies. Shortly after taking office, the Panic of 1837 struck the nation, and his inability to deal effectively with the economic crisis, combined with the growing political strength of the opposition Whig Party, led to his defeat. During his half-century of public service, he built, perfected, and defended a new system of political parties at first the state and then the federal level. A delegate to a political convention at age 18, he quickly moved from local to state politics, gaining fame both as a political organizer and an accomplished lawyer. Elected to the Senate by the New York State Legislature in 1821, he reorganized the Democratic-Republican Party in New York and established the Albany Regency to keep it in power. Van Buren supported William H. Crawford for president in the 1824 election. John Quincy Adams was then made president in a contingent election. The supporters of Jackson, who had won a plurality of the popular and electoral vote, coalesced around Jackson to create the new Democratic Party. Van Buren, alarmed by the nationalist policies of the Adams administration, soon joined them. Van Buren was a major supporter and organizer for Jackson in the 1828 election, and ran for Governor of New York in the hope of using his personal popularity to boost Jackson’s campaign. Jackson and Van Buren were elected, and after serving as governor for two months, Van Buren resigned to become Jackson’s Secretary of State. During Jackson’s eight years as president, Van Buren was a key advisor, and built the organizational structure for the coalescing Democratic Party, particularly in New York. He resigned as Secretary of State in 1831 to help resolve the Petticoat affair. Jackson gave Van Buren a recess appointment as American minister to Britain. Van Buren’s nomination was rejected by the Senate, cutting short his service in London, but he was elected vice president in the 1832 election. With Jackson’s strong support, Van Buren faced little opposition for the presidential nomination at the 1835 Democratic National Convention, and he defeated several Whig opponents in the 1836 presidential election. He was the first president to be born a United States citizen. Of Dutch ancestry, he is the only president who spoke English as a second language. As president, Van Buren was blamed for the depression of 1837; hostile newspapers called him “Martin Van Ruin”. He attempted to cure the economic problems by keeping control of federal funds in an independent treasury, rather than in state banks, but Congress would not approve of this until 1840. In foreign affairs, he denied the application of Texas for admission to the Union, unwilling to upset the balance of free and slave states in the Missouri Compromise, and hoping to avoid war with Mexico over Texas annexation. Additionally, relations with Britain and its colonies in Canada proved to be strained from the bloodless Aroostook War and the Caroline Affair. In the 1840 election, Van Buren was voted out of office, losing to Whig candidate William Henry Harrison. Van Buren was the leading candidate for the Democratic nomination in 1844, but his continued opposition to the annexation of Texas caused him to lose to James K. Polk, who went on to win the election. In the 1848 election, Van Buren ran unsuccessfully as the candidate of the anti-slavery Free Soil Party. He returned to the Democratic fold to endorse Franklin Pierce (1852), James Buchanan (1856), and Stephen A. Douglas (1860) for the presidency. His increasingly abolitionist views and support for the Union led him to support Abraham Lincoln‘s policies after the start of the American Civil War. Van Buren’s health began to fail in 1861, and he died in July 1862 at age 79. Martin Van Buren was born on December 5, 1782, in the village of Kinderhook, New York about 20 miles (32 km) south of Albany on the Hudson River. He was the first President not born a British subject, or even of British ancestry. He was a descendant of Cornelis Maessen of the village of Buurmalsen, near the town of Buren in the Netherlands, who had come to North America in 1631 and had purchased a plot of land on Manhattan Island; his son Martin Cornelisen took the surname Van Buren. His father, Abraham Van Buren (17371817), owned and operated an inn and tavern, and Martin was born in a house that was attached to the tavern. Abraham Van Buren supported the Patriot cause during the American Revolution as a captain in the Albany County Militia’s 7th Regiment, and later joined the Jeffersonian Republicans. He was active in local politics and government, and served as Kinderhook’s town clerk from 1787 to 1797. In 1776, Abraham Van Buren married Maria Hoes (or Goes) Van Alen (17471818), the widow of Johannes Van Alen. Although both Abraham and Maria Van Buren were fifth generation residents of the Province of New York, all of their forebears were of Dutch ancestry, as was the case for most of Kinderhook’s residents, and they still spoke Dutch as their first language. The future president was baptized on December 15, 1782, as “Maarten Van Buren”, the original Dutch spelling of his name. He had four full siblings and three half-siblings. Marytje (or Maria) Van Alen (1768-1829), married John L. Hoes. James I. Van Alen (1772-1822), who practiced law with Van Buren for a time and also served as a member of Congress (1807-1809). Dirckie “Derike” Van Buren (1777-1865), married Barent Hoes (1777-1853). Barent Hoes was the brother of Martin Van Buren’s wife, and served in local offices including town clerk. Jannetje (Called “Hannah” or “Jane”) Van Buren (1780-1838), who never married and who resided with her sister Dirckie Van Buren and brother-in-law Barent Hoes. Lawrence Van Buren (1786-1868), a store owner and attorney who served as a militia officer in the War of 1812 and held local offices including Kinderhook Town Supervisor, postmaster, and presidential elector in 1852. Abraham Van Buren (1788-1836), an attorney who served as Columbia County Surrogate after Martin Van Buren and James I. Van Alen. Van Buren received a basic education at the village schoolhouse and briefly studied Latin at the Kinderhook Academy and at Washington Seminary in Claverack. His formal education ended in 1796, when he began reading law at the office of Peter Silvester and his son Francis, prominent Federalist attorneys in Kinderhook. Van Buren learned early to interact with people from varied ethnic, income, and societal groups, which he would later use to his advantage as a political organizer. He was small in stature; as an adult he was 5 feet 6 inches tall, and was often referred to as “Little Van.” When he first began his legal studies, he often presented an unkempt appearance in rough, homespun clothing. The Silvesters admonished Van Buren about how crucial a lawyer’s clothing and personal appearance were to the success of his practice. He accepted their advice and patterned his clothing, appearance, bearing and conduct after theirs. After six years under the Silvesters, the elder Silvester and Democratic-Republican political figure John Peter Van Ness suggested that Van Buren’s political leanings constrained him to complete his education with a Democratic-Republican attorney. Accepting this advice, he spent a final year of apprenticeship in the New York City office of John Van Ness’s brother William P. Van Ness, a political lieutenant of Aaron Burr. Van Buren was admitted to the New York bar in 1803. Smith Thompson (1817-1876), an editor and special assistant to his father during Van Buren’s presidency. 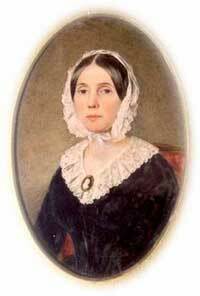 After 12 years of marriage, Hannah Van Buren contracted tuberculosis and died on February 5, 1819, at the age of 35. Martin Van Buren never remarried. Van Buren had been active in politics from age 18 if not before; he attended a Democratic-Republican Party convention in Troy, New York where he worked successfully to secure for John Peter Van Ness the party nomination in a special election for the 6th Congressional District seat. He formed a law partnership with his half-brother James I. Van Alen and became financially secure enough to increase his focus on politics. He was a supporter of Aaron Burr, and allied himself with the George Clinton faction of the Democratic-Republican Party. Van Buren supported Daniel D. Tompkins for Governor over incumbent Morgan Lewis in 1807. Tompkins won, and his allies won a majority in the state legislature. As a result, Van Buren was appointed Surrogate of Columbia County, New York, replacing Van Alen, who had supported Lewis. He served as Surrogate from 1808 until 1813, when the Federalist Party gained a majority in the state legislature and replaced him. Van Buren was a member of the New York State Senate from 1813 to 1820, and in 1813 joined the opposition partyNew York Democratic-Republicans who fought DeWitt Clinton for control of that party in New York. Van Buren served as New York Attorney General from 1815 to 1819. He replaced William Floyd as a presidential elector in 1820, and voted for James Monroe and Daniel D. Tompkins. Though he never served in the military, during the War of 1812 Van Buren worked in the State Senate to pass war measures, including bills to expand the New York Militia and increase soldier pay. In addition, he was a special judge advocate appointed to serve as a prosecutor of William Hull during Hull’s court-martial following the surrender of Detroit. In the winter of 181415 he collaborated with Winfield Scott on ways to reorganize the New York Militia in anticipation of another military campaign in 1815. The reorganization would have included a position for Van Buren at a rank to be determined, but the war’s end in February 1815 ended their work on the project. He initially opposed DeWitt Clinton’s plan for the Erie Canal, but relented when the Bucktails, the anti-DeWitt Clinton Democratic-Republicans, were able to gain a majority on the Erie Canal Commission; he supported a bill to finance its construction through the sale of state bonds. From 1816 to 1829, Van Buren served as a member of the University of the State of New York Board of Regents. In 1817, Van Buren’s connection with so-called “machine politics” started when he created the first political organization encompassing all of New York, the Bucktails. The Bucktails succeeded in emphasizing party loyalty and used it to capture and control many patronage posts throughout New York. Van Buren gained the nickname of “Little Magician” for the skill with which he exploited the “spoils system“. He was a member of the 1820 state constitutional convention, where he favored expanded voting rights, but opposed universal suffrage and tried to maintain property requirements for voting. He was the leading figure in the Albany Regency, a group of Bucktail leaders who for more than a generation dominated New York politics and influenced national politics. The Regency, together with other political organizations such as Tammany Hall, played a major role in expanding the spoils system and making it a recognized and accepted procedure. While organizing and overseeing the operations of the Regency, Van Buren resided in Albany; his housemate was Roger Skinner, a lifelong bachelor who was also a key Van Buren lieutenant in the State Senate and as Judge of the United States District Court for the Northern District of New York. Van Buren was the prime architect of the first nationwide political party: the Jacksonian Democrats or Democratic Party, which evolved from the Democratic-Republicans and relied on party loyalty and patronage to prevent contentious sectional issues, including tariffs and slavery, from becoming national crises. In Van Buren’s words, “Without strong national political organizations, there would be nothing to moderate the prejudices between free and slaveholding states.” As had James Madison and other Democratic Party organizers who favored states’ rights and local control, Van Buren was struggling to find an institutional solution to the Constitution’s seeming inability to prevent concentration of power in an administrative republic. In the presidential election of 1824, Van Buren supported the nominee of a Congressional caucus, Treasury Secretary William H. Crawford, and received the electoral votes of Georgia for Vice President. None of the presidential candidatesCrawford, John Quincy Adams, Andrew Jackson, or Henry Clayhad received a majority of the electoral college votes, so the choice fell to the United States House of Representatives. The House had to choose from among the top three candidates, so Clay was eliminated. Van Buren had originally hoped to block John Quincy Adams by denying him the state of New York, which was divided between supporters of Crawford and Adams. However, Representative Stephen Van Rensselaer swung New York to Adams. Adams won, and appointed Clay as Secretary of State. Because Clay had supported Adams in the House election, Jackson and Crawford supporters alleged corruption. After the House contest, Van Buren shrewdly kept out of the controversy which followed, and began looking forward to 1828. He switched his support early from Crawford, whose ill health after a stroke had made him a less than viable candidate, to Andrew Jackson, who had won the popular vote in 1824. Jackson was angered to see the presidency go to Adams after he received fewer popular votes, and eagerly looked forward to a rematch. Always notably courteous in his treatment of opponents, Van Buren showed no bitterness toward either Adams or Henry Clay, and he voted for Clay’s confirmation as Secretary of State, notwithstanding Jackson’s “corrupt bargain” charge. At the same time, he opposed the Adams-Clay plans for internal infrastructure improvements (roads, canals, bridges, etc.) and declined to support U.S. participation in the Congress of Panama. As chair of the Judiciary Committee, he brought forward a number of measures for the improvement of judicial procedure, including one (not adopted), which would have required a super-majority vote by the United States Supreme Court to declare a law unconstitutional. In May 1826, Van Buren joined with Senator Thomas Hart Benton in reporting on patronage in the executive branch, going against his own use of the spoils system to propose, in vain, that Presidents not be able to remove officeholders at will, and that Presidents report to Congress on the reason for dismissal of federal position holders. The 1828 “Tariff of Abominations” was recognized as his work. Since Democrats, especially Southerners, were generally opposed to tariffs that increased the price of manufactured goods from the North but did not benefit the raw materials produced in the South, Van Buren could normally have been expected to oppose tariffs. Political observers of the time viewed Van Buren’s efforts to pass the 1828 tariff as part of the campaign to elect Jackson as President. Anticipating that most Southerners would vote for Andrew Jackson no matter who else was running, Van Buren intended the tariff proposed by Jackson’s Northern Democratic supporters in Congress to attract to Jackson’s candidacy Northern voters, who generally favored high tariffs to protect the manufactured goods they produced. Van Buren voted in favor, later adopting the cover story that he had done so only in response to instructions from the New York State Legislature. Most Democrats, especially Southerners, continued to oppose tariffs after 1828. Van Buren’s political opponents in the Democratic Party used his 1828 vote against him for years afterwards to prevent him from obtaining Southern support for his candidacies. Van Buren was not an exceptional orator like Henry Clay or Daniel Webster, but his more important speeches show careful preparation and his opinions carried weight; the oft-repeated charge that he refrained from declaring himself on crucial questions is hardly borne out by scrutiny of his senatorial career. In February 1827, he was re-elected to the Senate by a large majority. He became one of the recognized managers of the Jackson campaign, and his tour of Virginia, the Carolinas, and Georgia in the spring of 1827 won support for Jackson from Crawford as Van Buren sought to reorganize and unify “the old Republican party” behind Jackson. At the state level, Jackson’s committee chairs would split up the responsibilities around the state and organize volunteers at the local level. “Hurra Boys” would plant hickory trees (in honor of Jackson’s nickname, “Old Hickory”) or hand out hickory sticks at rallies. In 1828 Van Buren ran for Governor of New York in an effort to use his personal popularity to bolster Jackson’s chances of carrying New York in the presidential election. Jackson defeated Adams handily, leading the pro-Adams New York American to editorialize “Organization is the secret of victory. By the want of it we have been overthrown.” Van Buren won his election, and resigned from the Senate to start the gubernatorial term, which began on January 1, 1829. Van Buren’s tenure as New York governor is the second shortest on record. While his term was short, he did manage to pass the Bank Safety Fund Law (an early form of deposit insurance) through the Legislature. On March 5, 1829, President Jackson appointed Van Buren Secretary of State, an office which probably had been promised him before the 1828 elections, and Van Buren resigned the governorship on March 12. He was succeeded by his Lieutenant Governor, Enos T. Throop, a member of the Regency. As Secretary of State, Van Buren sought congeniality with the Kitchen Cabinet, Jackson’s informal advisers. He sometimes opposed Jackson in the matter of removing political appointees from office to replace them with Jackson loyalists, but also saw to the replacement of postmasters in New York with Van Buren loyalists. In July 1829, Rutgers College awarded Van Buren the honorary degree of LL.D. No serious diplomatic crises arose during Van Buren’s tenure, but he achieved several notable successes, such as settling long-standing claims against France and winning reparations for property that had been seized during the Napoleonic Wars. He reached an agreement with the British to open trade with the British West Indies colonies and concluded a treaty with the Ottoman Empire that gained American merchants access to the Black Sea. Items on which he did not achieve success included settling the Maine–New Brunswick boundary dispute with Great Britain, gaining settlement of the U.S. claim to the Oregon Country, concluding a commercial treaty with Russia, and persuading Mexico to sell Texas. Van Buren also advised Jackson informally on matters of domestic policyin the controversy over the Bank of the United States, he sided with Jackson. He also allied with Jackson on the Indian Removal Act. After the breach between Jackson and Calhoun, which culminated with the Nullification Crisis, Van Buren’s position as one of Jackson’s primary political supporters and policy advisors clearly branded him as the most prominent candidate for the vice presidency in 1832, and Jackson’s most likely successor in 1836. In Jackson’s first term, Van Buren won the president’s lasting regard by his courtesies to Peggy Eaton, wife of Secretary of War John H. Eaton, whom the wives of the cabinet members and others had shunned over the circumstances surrounding their marriage and her alleged moral failures as a cabinet wife. Led by Floride Calhoun, wife of Vice President Calhoun, these women (the “petticoats”) socially ostracized the Eatons, refused to pay courtesy calls at their home or receive them as visitors, and denied them invitations to social events. Because Calhoun was the most visible opponent of the Jackson administration, Jackson felt that Calhoun and other anti-Jackson officials were fanning the flames of the Peggy Eaton controversy to gain political leverage. As a widower, Van Buren was unaffected by the position of the Cabinet wives, and he supported Jackson’s position that criticism of the Eatons would not be tolerated. By siding with Jackson, Van Buren helped create a counter-coalition that weakened Calhoun. The dispute was resolved when Van Buren offered to resign; in April 1831, Jackson accepted, and took the opportunity to reorganize his cabinet by asking for the resignations of Cabinet members whose wives were part of the anti-Eaton coalition. Postmaster General William T. Barry, who had sided with Jackson and Van Buren, was the lone cabinet member to stay, and Eaton eventually received appointments that took him away from Washington, first as governor of Florida Territory, and then as minister to Spain. After resigning as Secretary of State, Van Buren remained in office until June 1831, and continued to play a part in Jackson’s Kitchen Cabinet. In August 1831 Jackson gave Van Buren a recess appointment as Minister to the Court of St. James (Britain) and he arrived in London in September. He was cordially received, but in February he learned his nomination was rejected by the Senate on January 25, 1832. The rejection was attributed to Van Buren’s instructions while Secretary of State to Louis McLane, the American minister to Britain, which concerned the opening of the West Indies trade, and repudiated the foreign policy of Jackson’s predecessors, which the Senate claimed was a breach of decorum. The rejection of Van Buren was essentially the work of Calhoun, who had opposed Van Buren’s confirmation, believing that Van Buren had attempted to keep him from becoming vice president by making overtures to Henry Clay to run on a ticket with William H. Crawford, Van Buren’s preferred candidate for president in 1824. Calhoun also opposed Van Buren for his role in the Petticoat Affair and his work on the 1828 tariff. When the vote on Van Buren’s nomination was taken, enough pro-Calhoun Democrats refrained from voting to produce a tie, thus giving Calhoun, in his role as presiding officer, the ability to cast a vote. He voted against Van Buren, and so achieved “vengeance” on Van Buren. Calhoun was elated, convinced that he had ended Van Buren’s career. “It will kill him dead, sir, kill him dead. He will never kick, sir, never kick,” Calhoun exclaimed to a friend within earshot of Missouri Senator Thomas Hart Benton. Benton recognized the significance of Calhoun’s action, saying “You have broken a minister and made a vice president.”John Tyler, then serving as a Senator from Virginia, also recognized Calhoun’s overreach, writing to a friend that “Van Buren is elevated by the silly thing of rejecting him.” As Benton and Tyler foresaw, Calhoun’s move backfired, by making Van Buren appear the victim of petty politics, thus raising him in both Jackson’s regard and the esteem of others in the Democratic Party. Far from ending Van Buren’s career, Calhoun’s action gave greater impetus to Van Buren’s candidacy for vice president. After a brief tour of Europe, Van Buren reached New York on July 5, 1832. The May 1832 Democratic National Convention, the party’s first, had nominated him for vice president on the Jackson ticket. Van Buren’s nomination was not as strongly supported as Jackson’s, particularly among southerners who recalled his work on the tariff in 1828, but he somewhat placated southerners by denying the right of Congress to abolish slavery in the District of Columbia without the consent of the slave states. The Jackson-Van Buren ticket won the election of 1832 by a landslide, and Van Buren took office as Vice President in March 1833. During his time in office Van Buren continued to be one of Jackson’s primary advisors and confidants, and accompanied Jackson on his tour of the northeastern United States in 1833. Jackson’s confidence in Van Buren was further demonstrated after Jackson named Benjamin F. Butler, Van Buren’s political ally and former law partner, to serve as Attorney General, and John Forsyth, another Van Buren ally, to serve as Secretary of State. Van Buren’s support of Jackson in the Nullification Crisis and the decision not to recharter the Second Bank of the United States made him a target of Jackson’s most vocal opponents. Van Buren was threatened with violence, including explicit comments from Senator George Poindexter of Mississippi, which prompted Van Buren to carry pistols for self-defense. However he also demonstrated both the willingness and the ability to work with his opponents, cooperating with Clay and Calhoun (now a Senator) to pass the compromise Tariff of 1833, which helped end the Nullification Crisis. During one contentious debate on the bank issue, Van Buren presided over the Senate as Clay spoke passionately about the harm he believed Jackson’s bank policy would cause. Directing his remarks to Van Buren, Clay asked rhetorically whether Van Buren would approach Jackson and persuade him to change his mind. After Clay concluded, observers wondered how Van Buren would react. Van Buren’s response was to descend from the rostrum and ask Clay if he could borrow a pinch of snuff. Caught off guard, Clay reflexively handed over his snuff box. Van Buren took a pinch, bowed to Clay, and left the chamber, both deflating the effect of Clay’s remarks and preventing tension from escalating, as would have happened if Van Buren had attempted to reply directly. Jackson, not running in 1836, was determined to make Van Buren his successor in order to continue the Jackson administration’s policies. This conclusion on Jackson’s part soon became public. When the Democratic Convention met in Baltimore, Maryland in May, 1835, 18 months before the election, the delegates nominated Van Buren unanimously. Two names were put forward for the vice-presidential nomination: Representative Richard M. Johnson of Kentucky, and former senator William Cabell Rives of Virginia. Southern Democrats, and Van Buren himself, strongly preferred Rives. Jackson, on the other hand, strongly preferred Johnson. Again, Jackson’s considerable influence prevailed, however, Johnson received the required two-thirds vote only after New York Senator Silas Wright prevailed upon non-delegate Edward Rucker to cast the 15 votes of the absent Tennessee delegation in his favor. On the issue of slavery, Van Buren moved to obtain the support of southerners by assuring them that he opposed abolitionism and supported the maintaining of slavery in states where it had already existed. Regarding the national bank, Van Buren made clear that he opposed rechartering a national bank. To demonstrate consistency regarding his opinions on slavery, Van Buren cast the tie-breaking Senate vote in favor of engrossing a bill to subject abolitionist mail to state laws, thus ensuring that its circulation would be prohibited in the South. Van Buren won the election with 764,198 popular votes, only 50.9 percent of the total, and 170 electoral votes. 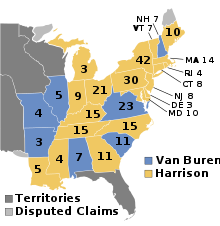 Harrison led the Whigs with 73 electoral votes, White receiving 26 and Webster 14. Willie P. Mangum of South Carolina received his states 11 electoral votes. His victory resulted from a combination of his own attractive political and personal qualities, Jackson’s popularity and endorsement, the organizational power of the Democratic party, and the inability of the Whig Partyat this pointto muster an effective candidate and campaign. Johnson, however, received only 147 electoral votes, 70 more than his closest contender, Francis Granger, but one less than the number required to elect. Virginia’s electors had remained loyal to Van Buren, who carried the state by a close margin, but instead, they all refused to vote for Johnson. He was the first president to be born after the United States Declaration of Independence from the Kingdom of Great Britain. On February 8, 1837, the U.S. Senate convened, and in accordance with the Twelfth Amendment chose the vice president from the two top electoral vote recipients, Johnson, and Granger. Johnson won the contingent vote, 33-17, and became the nation’s ninth vice president. 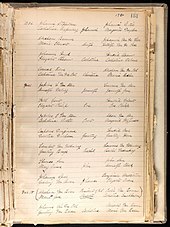 As the nation endured a deep economic depression, Angelica van Buren’s receiving style at receptions was influenced by her heavy reading on European court life (and her naive delight in being received as the Queen of the United States when she visited the royal courts of England and France after her marriage). Newspaper coverage of this, in addition to the claim that she intended to re-landscape the White House grounds to resemble the royal gardens of Europe, was used in a political attack on her father-in-law by a Pennsylvania Whig Congressman Charles Ogle. He referred obliquely to her as part of the presidential “household” in his famous Gold Spoon Oration. The attack was delivered in Congress and the depiction of the President as living a royal lifestyle was a primary factor in his defeat for re-election. When Van Buren entered office, the nation’s economic health had taken a turn for the worse and the prosperity of the early 1830s was over. Two months into his presidency, on May 10, 1837, some important state banks in New York, running out of hard currency reserves, refused to convert paper money into gold or silver, and other financial institutions throughout the nation quickly followed suit. This financial crisis would become known as the Panic of 1837. The Panic was followed by a five-year depression in which banks failed and unemployment reached record highs. Van Buren blamed the economic collapse on greedy American and foreign business and financial institutions, as well as the over-extension of credit by U.S. banks. 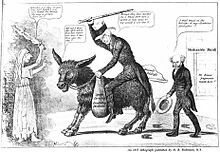 Whig leaders in Congress blamed the Democrats, along with Andrew Jackson’s economic policies, specifically his 1836 Specie Circular. Cries of “rescind the circular!” went up and former President Jackson sent word to Van Buren asking him not to rescind the order, believing that it had to be given enough time to work. Others, like Nicholas Biddle, believed that Jackson’s dismantling of the Bank of the United States was directly responsible for the irresponsible creation of paper money by the state banks which had precipitated this panic. To deal with the crisis, the Whigs proposed rechartering the national bank. The president countered by proposing the establishment of an independent U.S. treasury, which would take the politics out of the nation’s money supply; the government would hold all of its money balances in the form of gold or silver and would be restricted from printing paper money at will, a measure designed to prevent inflation. Van Buren announced his proposal in September 1837; but that was too much for state banking interests, and an alliance of conservative Democrats and Whigs prevented it from becoming law until 1840. The independent treasury lasted only one yearthe Whigs, who won a congressional majority and the presidency in the 1840 elections, promptly repealed the law. By the time Congress finally acted, the nation’s economy had been mired in a depression for nearly four years; the problems would continue into the early 1840s. More important for Van Buren’s immediate future, the depression would be a major issue in his upcoming re-election campaign. In 1838, Van Buren directed General Winfield Scott to forcibly institute the removal of all those Cherokee who had not complied with the 1835 Treaty of New Echotaby departing from the Southeastern United States and moving west (to present day Oklahoma). The Cherokee were herded violently into internment camps, where they were kept for the summer of 1838. The actual transportation west was delayed by intense heat and drought, but in the fall, the Cherokee reluctantly agreed to transport themselves west. During the Cherokee removal, part of the Trail of Tears, some 20,000 people were involuntarily relocated. In the course of Van Buren’s presidency the federal government negotiated 19 treaties with Indian nations. The administration also contended with the Seminole in Florida, who engaged the army in a seven-year battle. Known as the Second Seminole War, the battle began in 1835 during Jackson’s presidency. Fighting was not resolved until 1842, after Van Buren had left office. It is regarded as the longest and most costly of the nation’s Indian conflicts. In 1839, Joseph Smith, Jr., the founder of the Latter Day Saint movement, visited Van Buren to plead for the U.S. to help roughly 20,000 Mormon settlers of Independence, Missouri (who were forced from the state during the 1838 Mormon War.) The Governor of Missouri, Lilburn Boggs, had issued an executive order on October 27, 1838, known as the “Extermination Order”. It authorized troops to use force against Mormons to “exterminate or drive from the state”. In 1839, after moving to Illinois, Smith and his party appealed to members of Congress and to President Van Buren to intercede for the Mormons. According to Smith’s grandnephew, Van Buren said to Smith, “Your cause is just, but I can do nothing for you; if I take up for you I shall lose the vote of Missouri”. In a bold step, Van Buren reversed Andrew Jackson’s policies and sought peace at home, as well as abroad. Instead of settling a financial dispute between American citizens and the Mexican government by force, Van Buren wanted to seek a diplomatic solution. In an action that upset political leaders of the pro-slavery states, in August 1837, Van Buren denied Texas‘ formal request to join the United States, partly to prevent the upset of the slave state/free state balance in the Missouri Compromise, and partly because he hoped to avoid a possible war with Mexico over Texas annexation. British subjects in Lower Canada (now Quebec) and Upper Canada (now Ontario) rose in rebellion in 1837 and 1838 respectively, protesting their lack of responsible government. The rebellion in Upper Canada was led by William Lyon Mackenzie and Charles Duncombe. While the initial insurrection in Upper Canada ended quickly (following the December 7 Battle of Montgomery’s Tavern), many of the rebels fled across the Niagara River into New York, where Mackenzie began recruiting volunteers in Buffalo. On December 13, Mackenzie declared establishment of the Republic of Canada and put into motion a plan whereby volunteers would invade Upper Canada from Navy Island on the Canadian side of the Niagara River. Several hundred volunteers procured the steamboat Caroline to deliver supplies and arms to Navy Island from Fort Schlosser. To deter an imminent invasion, British forces crossed to the American bank of the river, where they burned and sank the ship. 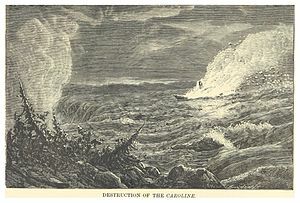 When an American was killed and others wounded, considerable sentiment arose within the United States to declare war, and a British ship was burned in revenge. Soon afterward, Mackenzies “republic” collapsed, and the rebels withdrew into the U.S.; the initial uprising in Lower Canada by then collapsed as well. Van Buren, looking to avoid a war with Great Britain, sent General Winfield Scott to the border with broad discretionary powers for its protection and its peace. Scott impressed upon American citizens the need for a peaceful resolution to the crisis, and made it clear that the U.S. government would not support adventuresome Americans attacking the British. Also, in early January 1838, the president proclaimed U.S. neutrality with regard to the Canadian independence issue, a declaration which Congress endorsed by passing a neutrality law discouraging the participation of American citizens in foreign conflicts. Simultaneously Charles Duncombe and Robert Nelson helped foment a largely American militia, the Hunters’ Lodge/Frères chasseurs, which carried out several attacks in Upper Canada between December 1837 and December 1838, collectively known as the Patriot War. The administration followed through on its enforcement of the Neutrality Act, encouraged the prosecution of filibusters, and actively deterred U.S. citizens from subversive activities abroad. In the long term, the Patriot War contributed to the construction of healthy AngloAmerican and U.S.Canadian relationships in the 20th century; it also led, more immediately, to a backlash among citizens against the overreach of federal authority, which hurt congressional Democrats in the 1838 midterm elections. Another crisis surfaced in late 1838, in the disputed territory on the MaineNew Brunswick frontier, where Americans were settling on disputed land claimed by the United States and Great Britain. Both American and New Brunswick lumberjacks cut timber in the disputed territory during the winter of 183839. On December 29, New Brunswick lumbermen were spotted cutting down trees on an Americans estate near the Aroostook River. American woodcutters rushed to stand guard. A shouting match, known as the Battle of Caribou, ensued. Tensions quickly boiled over into a near war with both Maine and New Brunswick arresting each other’s citizens. The crisis seemed ready to turn into an armed conflict. British troops began to gather on the Saint John River. The American press clamored for war; Maine and her soil, or BLOOD! screamed one editorial. Let the sword be drawn and the scabbard thrown away! Congress authorized 50,000 troops and a $10 million budget. To settle the crisis, Van Buren met with the British minister to the United States. They agreed to resolve the border issue diplomatically. Van Buren also sent General Scott to the northern border area to show military resolve and more importantly to lower the tensions. Scott successfully convinced all sides to submit the border issue to arbitration. The dispute was put to rest a few years later, with the signing of the 1842 WebsterAshburton Treaty. The Amistad case was a freedom suit that involved international issues and parties, as well as United States law, resulting from the rebellion of Africans on board the Spanish schooner La Amistad in 1839,. The Van Buren administration supported the Spanish government’s demand that the ship and its cargo (including the Africans) be turned over to them. When a Federal District Court judge ruled that the Africans were legally free and should be transported home, the administration appealed the case to the Supreme Court. In February 1840, former President (and sitting U.S. Representative from Massachusetts) John Quincy Adams argued passionately for the Africans’ right to freedom. Attorney General Henry D. Gilpin presented the governments case. In March 1841, the Supreme Court issued its final verdict: the Amistad Africans were free people and should be allowed to return home. The unique nature of the case, people of color testifying in federal court, and being represented by prominent lawyers, heightened public interest in the saga, as did the participation of former president Adams. The Amistad case drew attention to the personal tragedies of slavery and attracted new support for the growing abolition movement in the North. It also transformed the courts into the principal forum for a national debate on the legal foundations of slavery. Martin Van Buren announced his intention “to follow in the footsteps of his illustrious predecessor”, and retained all but one of Jackson’s cabinet. Van Buren also appointed eight other federal judges, all to United States district courts. The Panic of 1837 loomed large over the 1838 election cycle, as the carryover effects of the economic downturn led to Whig gains in both the U.S. House and Senate. Also, while the Democratic Party retained a majority in both chambers, a split among House Democrats led to Whig Congressman Robert M. T. Hunter being elected Speaker of the House for the 26th Congress. Likewise, state elections in 1837 and 1838 were disastrous for the Democrats, and the partial economic recovery in 1838 was offset by a second commercial crisis later that year. Van Buren easily won renomination for a second term at the 1840 Democratic National Convention, but he and his party faced a difficult election in 1840. Van Buren’s presidency had been problematic, with the U.S. economy mired in a severe downturn; also of concern were several divisive issuesslavery, western expansion, and tensions with Great Britainthat provided opportunities for Van Buren’s political opponents, and even some fellow Democrats to criticize him. Although Van Buren’s renomination was never in doubt, Democratic strategists began to question the wisdom of keeping Johnson on the ticket. Even former president Jackson conceded that Johnson was a liability and insisted on former House Speaker James K. Polk of Tennessee as Van Buren’s new running mate. With William Henry Harrison, Johnson’s former commander and comrade-in-arms and the “Hero of Tippecanoe,” emerging as a likely Whig presidential contender, Van Buren was reluctant to drop the Democrats’ own hero from the ticket. The convention decided to allow state Democratic Party leaders to select the vice-presidential candidates for their states. The Whigs did select Harrison as their nominee, and presented him to the nation as the antithesis of the president, whom they derided as ineffective, corrupt, and effete. Van Buren was blamed for the hard economic times, and ridiculed as “Martin Van Ruin”. Van Buren’s rather elegant personal style was also an easy target for Whig attacks, such as the Gold Spoon Oration. Van Buren remained optimistic about his chances for reelection until October 1840, by which time it became unlikely that he would defeat Harrison. An astonishing 80 percent of eligible voters went to the polls on election day. Harrison won by a popular vote of 1,275,612 to 1,130,033, and an electoral vote margin of 234 to 60. Additionally, Whigs won majorities for the first time in both the U.S. House and the Senate. On the expiration of his term, Van Buren returned to his estate, Lindenwald in Kinderhook, where he planned his return to the White House. He seemed likely to be nominated by the Democrats in 1844, but in April of that year a Van Buren letter to William H. Hammett was made public. In it, Van Buren opposed the immediate annexation of Texas, but said that he would support annexation once the state of war between Texas and Mexico was resolved. 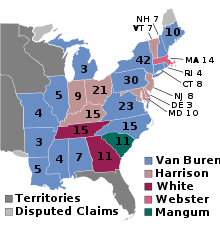 Van Buren’s opposition to immediate annexation cost him the support of pro-slavery Democrats; he began the Democratic National Convention with a majority of the delegates, but with no southern support he could not reach the two-thirds threshold required for nomination. His name was withdrawn after eight ballots, and a dark horse, James K. Polk, received the nomination and went on to win the presidency. After taking office, Polk used George Bancroft as an intermediary to offer Van Buren the ambassadorship to London. Van Buren declined, partly because he was upset with Polk over the treatment the Van Buren delegates had received at the 1844 convention, and partly because he was content in his retirement. While in the State Senate Van Buren voted for a resolution instructing New York’s members of Congress to vote against the admission of Missouri as a slave state. However, despite these antislavery views, during his term of office there was no ambiguity about his position on the abolition of slavery. He actually considered slavery immoral, but sanctioned by the Constitution. Consequently, Van Buren believed he had no choice but to oppose any attempt on the part of Congress to abolish slavery in the District of Columbia against the wishes of the slave-holding States, and to resist the slightest interference with it in the states where it existed. After leaving the White House, Van Buren grew increasingly opposed to slavery, and his earlier views about its constitutional standing gave way over time to acceptance of anti-slavery positions including opposing slavery’s expansion into newly organized western states. In 1848, he was nominated for president by two minor parties, first by the “Barnburner” faction of the Democratic Party in New York, then by the Free Soil Party, with whom the “Barnburners” coalesced. The Barnburners and Free Soilers opposed Democratic nominee Lewis Cass, who opposed the Wilmot Proviso and was otherwise seen as friendly to slavery. In addition, Van Buren, who had been denied the 1844 nomination by Cass supporters despite having begun the convention with a majority of delegates, may have run in order to exact a measure of revenge by denying Cass the presidency. Van Buren won no electoral votes, but finished second to Whig nominee Zachary Taylor in New York, taking enough votes from Cass to give the stateand perhaps the electionto Taylor. Unlike many anti-slavery Democrats of the 1840s and 1850s, who later joined the Republican Party, Van Buren and most of his followers remained in the Democratic fold, including his son John Van Buren and Samuel J. Tilden, who later served as Governor of New York and was the Democratic nominee for President in 1876. Van Buren supported Franklin Pierce for President in 1852, and James Buchanan in 1856, though he later opposed the Buchanan administration’s efforts to accommodate the southern states when they threatened secession. In the election of 1860, he supported Stephen A. Douglas, the candidate of northern Democrats, and helped create a fusion ticket in New York of Democratic electors pledged to both Douglas and John C. Breckinridge, but Abraham Lincoln carried New York and every northern state except New Jersey. Once the American Civil War began, Van Buren made public his support for the Union, and supported Abraham Lincoln‘s efforts to prevent the southern states from seceding. In April, 1861 former President Pierce wrote to the other living former Presidents and asked them to consider meeting in order to use their stature and influence to propose a negotiated end to the war. Pierce asked Van Buren to use his role as the senior living ex-President to issue a formal call. Van Buren’s reply suggested that Buchanan should be the one to call the meeting, since he was the former President who had served most recently, or that Pierce should issue the call himself if he strongly believed in the merit of his proposal. Neither Buchanan or Pierce was willing to make Pierce’s proposal public, and nothing more resulted from it. Van Buren’s health began to fail later in 1861, and he was bedridden with pneumonia during the fall and winter of 186162. He did not recover, and died of bronchial asthma and heart failure at his Lindenwald estate in Kinderhook at 2:00 a.m. on July 24, 1862, at the age of 79. He is buried in the Kinderhook Reformed Dutch Church Cemetery, as are his wife Hannah, his parents, and his son Martin Van Buren, Jr.
During the 1988 presidential campaign, George H. W. Bush, a Yale University graduate and member of the Skull and Bones secret society, was attempting to become the first incumbent Vice President to win election to the presidency since Van Buren. In the comic strip Doonesbury artist Garry Trudeau depicted members of Skull and Bones as attempting to rob Van Buren’s grave, apparently intending to use the relics in a ritual that would aid Bush in the election. On the television show Seinfeld, the episode “The Van Buren Boys” is about a fictional street gang that admires Van Buren and bases its rituals and symbols on him, including the hand sign of eight fingers pointing up. Eight fingers signifies Van Buren, the eighth President. Martin Van Buren was portrayed by Nigel Hawthorne in the 1997 film Amistad. The film depicts the controversy and legal battle surrounding the status of slaves who in 1839 rebelled against their transporters on La Amistad slave ship. In Episode 1 Season 2 of Veep (‘Midterms’), Vice President Selina Meyer is told that a colleague’s office is opposite the picture of ‘Fat Wolverine’. In the next scene the picture is revealed to be of Martin Van Buren. In an early scene of the film Two Faces of January, the main characters  American expatriates in Athens  encounter an American tourist and discover that she is a Van Buren descendant. They then argue over whether Martin Van Buren was the seventh or eighth President. The USS Van Buren is a fictional Navy aircraft carrier named for President Van Buren which has appeared in the television show NCIS: Los Angeles.